The Scottish Seabird Centre offers the chance to see wildlife in its natural habitat. This is live activity that visitors to the Discovery Centre are controlling. The webcam images above refresh every 5 seconds and are transmitted live from our solar powered cameras. The Bass Rock is home to over 150,000 gannets at the peak of the season making it the world's largest colony of Northern gannets. It was BBC Countryfile Magazine's Nature Reserve of the Year 2014/15 and 2015/16. The gannets spend most of the year on the Bass, until the end of October when they set out on their long journey down to the west coast of Africa. Find out how you can adopt your own gannet family, with all proceeds invested in the charity. The lower ledges of the Bass are home to shags, guillemots and razorbills, with seals hauling up on the rocks below. If you like what you see, why not visit the Discovery Centre and control the cameras for yourself. You can extend your Seabird experience with a seasonal boat trip. If you take any nice photos of the Bass Rock share them with us on Facebook, Twitter or Instagram with #BassRock #SeabirdCentre #seabirddays. 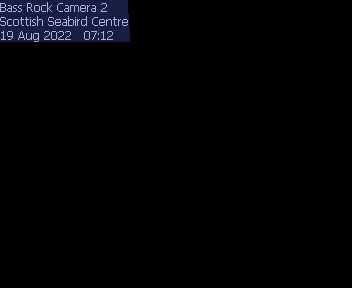 If this screen appears black, green or frozen, the cameras may have been switched off overnight or to allow researchers on the islands to carry out their work. We apologise for any inconvenience.